Somebody asked, me, as we entered the venue, what the play was about. At that point I had to honestly admit that I had absolutely no idea at all. The subject matter of Margaret Thatcher had been enough, along with an elaborately designed and somewhat macabre poster image to merit further investigation of the latest touring theatre production by Liverpool based writer Mike Francis Carvalho. To many on Merseyside it is fair to assume that the return of said politician was hardly something to hang the flags out for. Half expecting a disgruntled rant, I became increasingly and pleasantly surprised at the content and depth of the journey that followed. There was no Maggie scapegoat to laugh behind your hand with, and any on-stage humour, like the anguish, was very much shared out in an engaging communal experience. Meet the Real Maggie Thatcher is like a prong or blade you could relieve an itch with, equally as satisfying, but not intentionally at least quite enough to puncture the skin. Just when it has taken you out of your comfort zone it pulls you back again to take a breath, before being faced with another chapter or account in an unfolding tale of the 1980’s, and in some cases a regionalised guide to what is left behind by Thatcher’s legacy today. The piece is certainly original; there is no doubt about that. In the after show question session both writer and truly excellent performer Mike Francis Carvalho, along with former Brookside television director Illy, reinforced their collective intention to provide a very personal experience to every audience member. In some magical way it was clear from the audience comments that goal had certainly been achieved. Due to ongoing legal enquiries some material was apparently off limits, at least in terms of advertising purposes. However, on stage very little was left out. Perfect visualisation created a scene where I was actually able to clearly feel a police charge during the intense portrayal. Having lived through the Thatcher era so many memories were brought back, although it is fair to say the production equally appealed to a number of younger students who had come to the Small Cinema for the show. Nominated for a National Best Play Award in 2014, and judging by the audience reaction tonight, it is extremely easy to understand why. 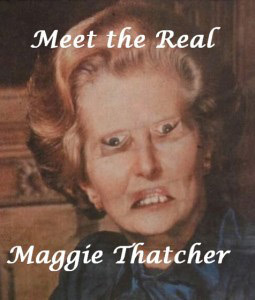 Meet the Real Maggie Thatcher is modern drama at its very best.